Unfortunately, the text is geared to a Canadian reader, although it is really quite readable. 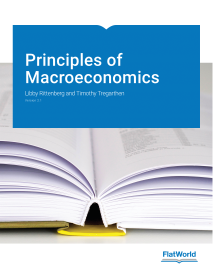 'Macroeconomic: Theory, Models and Policy is focused on the material that students need to cover in a first introductory course. It is slightly more compact than the majority of introductory macroeconomics books in the Canadian marketplace. Decades of teaching experience and textbook writing has led the authors to avoid the encyclopedic approach that characterizes the recent trends in textbooks. Consistent with this approach, there are no appendices or ‘afterthought’ chapters. If important material is challenging then it is still included in the main body of the text; it is not relegated elsewhere for a limited audience; the text makes choices on what issues and topics are important in an introductory course. This philosophy has resulted in a Macro book of just 15 chapters, with three introductory chapters and the International Trade chapter, common to both Micro and Macro. Examples are domestic and international in their subject matter and are of the modern era – financial markets, monetary and fiscal policies aimed at inflation and debt control, globalization and the importance of trade flows in economic structure and concerns about slow growth and the risk of deflation are included. You just viewed Macroeconomics Theory, Models and.... Please take a moment to rate this material. If you know the author of Macroeconomics Theory, Models and Policy, please help us out by filling out the form below and clicking Send.